More than a name, it is a brand of quality. “Professional. Unbiased. Quality second to none. With 300 Million Readers and 19 years online we have built a solid, trustworthy and dependable reputation; these are some of the reasons we are the leading motorcycle website in North America. Total Motorcycle; your destination for everything motorcycle related from guides, community forums, bike, gear, products and accessory reviews, views and opinions and an additional 400,000 pages of you just need more. Did you know that Google.com is just 1 year older than Total Motorcycle.com? That’s how long Total Motorcycle has been on the internet helping support motorcyclists and motorcycling worldwide! In fact, Total Motorcycle is 4 years older than Facebook! And can you imagine a time when Google and Facebook wasn’t around? Well, this has got to be one of the least frequently updated sections of the website. It is not because we don’t get accolades, awards, letters of appreciation or offers to visit fans around the world, we do! Let’s face it, I am just modest! Here are some of the things we are very proud of we would like to share with you, visiting our website and reading this right now. successful in supporting motorcyclists and motorcycling worldwide for over 12 years. Just some words of whit ! I found your web page yesterday via Yahoo.com on a general search. I just wanted you to know that so far it is the BEST motorcycle web page I have come across. It is just packed full of good information. I was looking at the Suzuki DR 650SE. I got the brochure from the dealer and it does not have the horse power of the bike listed at all. You web page does, and so much more. If I had four hands I’d give you people four thumbs up! Great job and keep up the great job. THANK YOU SO MUCH FOR PROVIDING THIS RESOURCE! I just really wanted to let you know how much I appreciate that this is here – the new rider stories and everything is so helpful! Beginning in motorcycling is like joining a secret society and trying to figure out the password by yourself it seems but your site really clarifies a lot of things for me. So thank you very much for providing such a great resource! I love the site and will continue to send new riders there. are just great. Thanks again! Hey! Just found your site and spent all morning crusin here, great place! Hi, first of all, great website! Loads of information! Howdy! I just discovered your website and am loving it. Great work! Just wanted to let you know I really enjoy reading the forums on your website. This is awesome. I have just found your web site and could not be happier. I’ve been on the TMW forums for about 2 months now, and I love the site! When I initially decided to get back into riding, I signed into four different motorcycle forums, including yours. I have since eliminated all but yours. 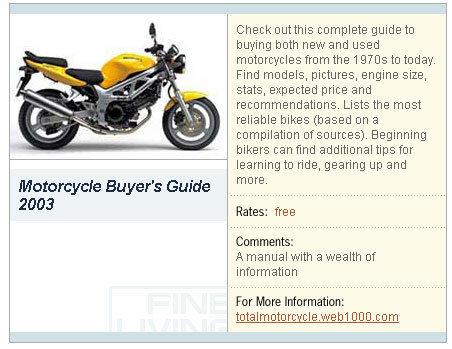 Have recently discovered your superb motorbiking web site at http://totalmotorcycle.web1000.com/index.html. What an excellent website with lots of excellent articles, links & things to think about!!!!! Many thx for making this so freely available on the web! Last Sunday, I got my 1975 Honda CB-750 as a “parting gift” from my boyfriend… I know virtually nothing about motorcycles, but I knew I wanted this bike. He showed me how to start it, get it into first gear and cruise in a straight line, then he left. So here I am with a big, cool motorcycle and not really a clue of what to do… then I just managed to surf onto your site tonight and have spent the past couple hours diligently reading all you’ve written for beginner bikers. THANK YOU! It has been the most comprehensive site I’ve found yet for information for a beginner like me. I plan on taking the MSF course as soon as I can carve away three days in my schedule and plan on following your guide to learning how to ride on the road. I just wanted to say how much I appreciate the information and again thank you for posting it. Thanks to your advice, I ordered some tubes of Autosol from mscdirect.com and also bought some Mother’s pre-wax cleaner and Meguiar’s gold wax. I haven’t got around to using the wax yet…these past few nights have been spent working with the Autosol on the exhaust, engine covers, forks, etc. It took some work using sponges but the chrome and aluminum looks almost brand new. Engine covers that I thought needed replaced look practically brand-new and shiny now. I have to admit I am absolutely amazed. Even the exhaust which had rust and discoloration is back to a nice shiny chrome. I plan to send a couple before and after pics to you when I’m done. Anyway, I am a true believer of Autosol…the stuff works wonders. I think the beginning bikers section is just fine the way it is. Your suggestion on taking the safety courses offered was the best thing you could say. It teaches you so many things you never think about. I already had my license, but decided to take it anyway. What an eye-opener. I never realized how many things I did or could do differently. Well thanks again for such a great site. I’ll be sure to check back often. Great little web page you put together! and your page made first hit! Thank god it did! bikes, recommending parts, and providing the links! Take care, and ride safe! …and last but not least the tonnes of thank you’s I get from those who submit their motorcycle photos in our Galleries. Thank you all for making this huge effort all worth it. Practical Living / Fine Living Magazine features our website in their selects section as one they best liked as a resource of information! 1. Fine Living Selects are an editorial feature of Fine Living Network and FineLiving.com and adhere to strict journalistic standards. They feature products and services in the Fine Living categories that would be of interest to viewers and website visitors. 2. Fine Living editors choose Fine Living Selects by speaking to experts and searching the Web, catalogs and magazines without regard to any commercial interaction or affiliation agreement between the manufacturer or service provider and Fine Living or other Scripps Network or business unit. 3. Selections are made based on form, function, value, quality of experience and interest to viewers and/or website visitors. December 28th, 2003: On page 27 you will find Total Motorcycle featured under the Wicked Websites section. Thanks to the Bikers Atlas for featuring us. February 20h, 2004: Thanks to the United Kingdom’s Bike Trader for featuring us in their magazine. We thank them very much for taking notice of our (Total Motorcycle) growing website and for the line “It has more or less anything that any biker – from novice to life-ling rider – could wish for”… Many thanks from all of us at TMW! November 25th, 2006 on Radio 4 at 1545: Program name Engines on Song; BBC 4. When a car engine is in tune, it is said to be ‘On Song’. What a good excuse to immerse ourselves in the songs and stories that have been inspired by car engines over the years! Singer/songwriter Chris Rea and experimental guitarist Jeff Beck join Alun Lewis for 15 minutes of gratuitous engine revs, and with the help of James May from Top Gear, find out how and why different cylinder engines can produce such evocative sounds. It will air at 15:45. Thanks to the BBC Radio 4 for featuring us on BBC Radio Four. December 6th, 2006: A special thank you to Susan Carpenter, Times Staff Writer for the Los Angeles Times for involving Total Motorcycle with her Believable MPG Figures column in the L.A. Wheels section. We are more than happy to help her out and gratefully thank Susan and the Los Angeles Times Newspaper for mentioning Total Motorcycle in the column. Many thanks from all of us at TMW! On May 21st, 2007, Total Motorcycle founder Mike Le Pard has been invited to talk about the world of motorcycles and motorcycling on CISL Radio 650 Vancouver. Be sure to check it out and listen live on your radio or via the Internet! Join Brodie Giles and Roberta Horwood as they hit the airwaves at 650 CISL to talk about riding. They will look at the entire spectrum of transportation from Show ‘n Shine Classics to 4×4’s; trail bikes to Hot Rods; Vespas to Harleys. They will look for the best places to ride, on or off road and discuss the best places to stay when you’re on a long ride. They will also look for the best places to get rides serviced, repaired, or rebuilt. If it moves on wheels, Brodie and Roberta will be covering the latest insight and information. Total Motorcycle extends a warm friendly welcome to all our international visitors regardless where they are from. Albania, Algeria, Andorra, Angola, Anguilla, Antigua and Barbuda, Argentina, Armenia, Aruba, Australia, Austria, Azerbaidjan, Bahamas, Bahrain, Bangladesh, Barbados, Belarus, Belgium, Belize, Bermuda, Bhutan, Bolivia, Bosnia-Herzegovina, Brazil, British Indian Ocean Territory, Brunei Darussalam, Bulgaria, Burkina Faso, Cambodia, Cameroon, Canada, Cape Verde, Cayman Islands, Central African Republic, Chile, China, Colombia, Congo, Cook Islands, Costa Rica, Croatia, Cuba, Cyprus, Czech Republic, Denmark, Djibouti, Dominica, Dominican Republic, Ecuador, Egypt, El Salvador, Equatorial Guinea, Estonia, Ethiopia, European Union, Falkland Islands, Faroe Islands, Fiji, Finland, France, Gabon, Gambia, Georgia, Germany, Ghana, Gibraltar, Great Britain, Greece, Greenland, Grenada, Guadeloupe (French), Guam (USA), Guatemala, Guinea, Guyana, Haiti, Honduras, Hong Kong, Hungary, Iceland, India, Indonesia, Iran, Ireland, Israel, Italy, Ivory Coast (Cote D’Ivoire), Jamaica, Japan, Jordan, Kazakhstan, Kenya, Kuwait, Kyrgyzstan, Laos, Latvia, Lebanon, Lesotho, Liberia, Libya, Liechtenstein, Lithuania, Luxembourg, Macau, Macedonia, Madagascar, Malawi, Malaysia, Maldives, Mali, Malta, Martinique (French), Mauritius, Mexico, Micronesia, Moldova, Monaco, Mongolia, Morocco, Mozambique, Myanmar, Namibia, Nauru, Nepal, Netherlands, Netherlands Antilles, New Caledonia (French), New Zealand, Nicaragua, Niger, Nigeria, North Korea, Norway, Oman, Pakistan, Palestinian Territories, Panama, Papua New Guinea, Paraguay, Peru, Philippines, Poland, Polynesia (French), Portugal, Puerto Rico, Qatar, Reunion (French), Romania, Russian Federation, Rwanda, Saint Kitts & Nevis Anguilla, Saint Lucia, Saint Vincent & Grenadines, Samoa Islands, San Marino, Sao Tome and Principe, Saudi Arabia, Senegal, Singapore, Slovak Republic, Slovenia, Solomon Islands, South Africa, South Korea, Spain, Sri Lanka, Sudan, Sweden, Switzerland, Syria, Tadjikistan, Taiwan, Tanzania, Thailand, Togo, Tonga, Trinidad and Tobago, Tunisia, Turkey, Turkmenistan, Turks and Caicos Islands, Tuvalu, Uganda, Ukraine, United Arab Emirates, United States of America, Uruguay, Uzbekistan, Vanuatu, Vatican City State, Venezuela, Vietnam, Virgin Islands (British), Virgin Islands (USA), Yemen, Yugoslavia, Zambia, Zimbabwe.